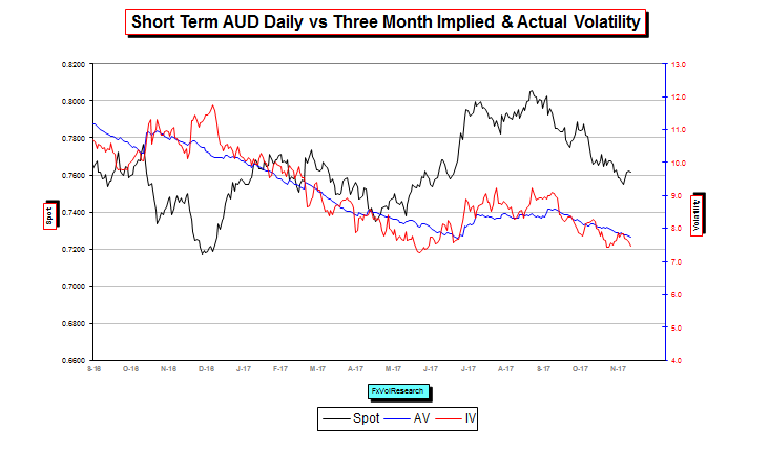 Three Month AUD vols are nearly back to their lows for the year while the implied vols move into negative territory vs the realized vols. 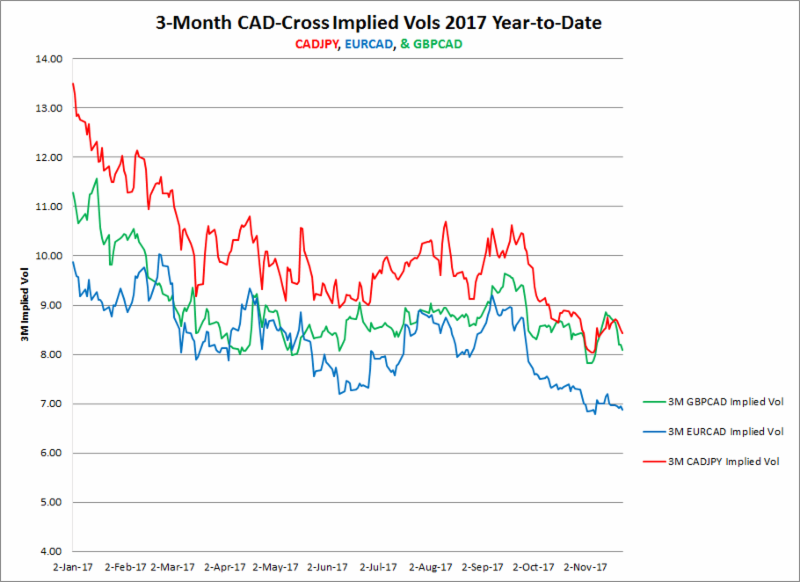 CAD-Cross vols declined last week with EURCAD 3M implied making a new low for the year. 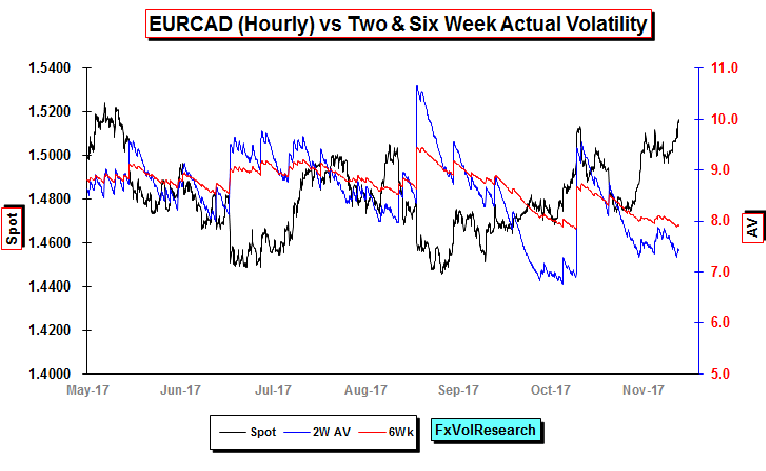 With six-week EURCAD realized vols running at about 8% and the implied threatening to trade under 7% this looks like a fairly safe buying opportunity; expressive the view that future realized will not trade much lower. 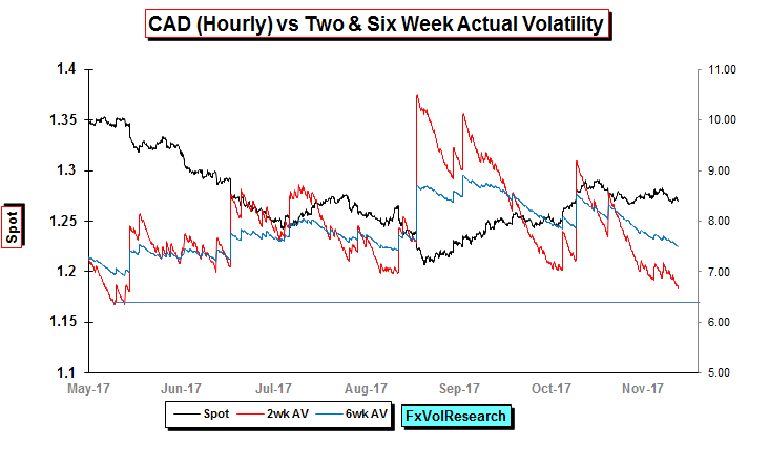 USDCAD actuals also declined on the week with the three months implied vol now back to just over 6%. We continue to see value in the three month period if you can own it under 6%. Short-term technical indicators such as Vortex have now turned very weakly positive on CAD. However short-term momentum is oscillating around part. Short term 2YR US-CAD interest rate differentials remain in positive territory for further US$ strength, however the commodity complex, in particular, oil prices remain supportive in the near term. Until one or both of these short-term factors is removed the CAD is likely to remain range bound, however, we remain of the view that the weaker tone to fundamental CAD releases will keep the interest rates differential uppermost and lead to a re-test of 1.3000 by year-end. 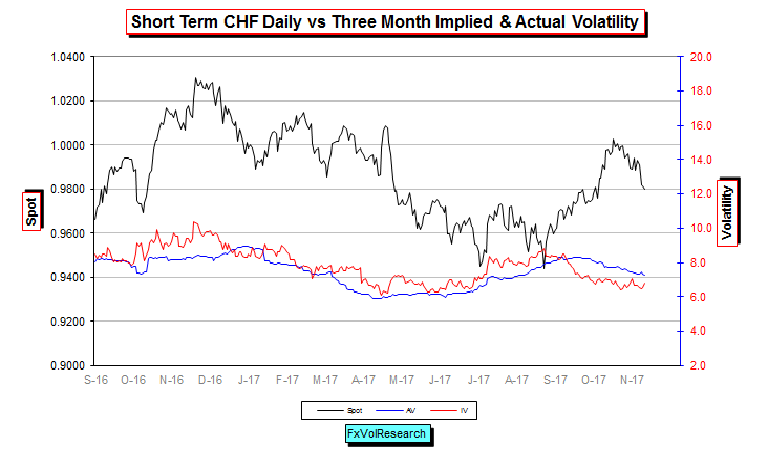 With CHF gaining ground last week in line with the EUR, CHF implied vols have started to turn up from low levels. We would continue to hold 9950/9650 CHF call spreads and look to take profit on a move down to 9600. 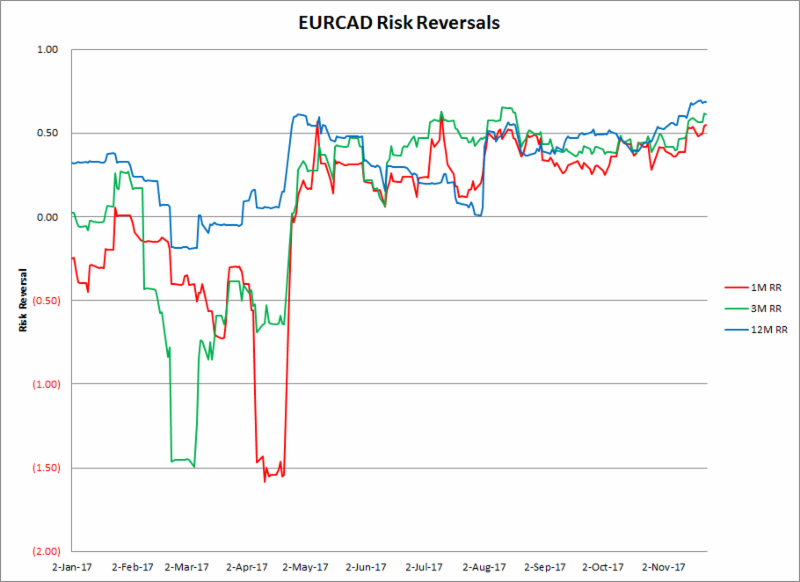 In line with EUR risk reversals, EURCAD risk reversals moved up on the week with the spot close to taking out the 1.5200 level. Note however that most of the premium for EUR calls vs CAD is in the back end of the curve. 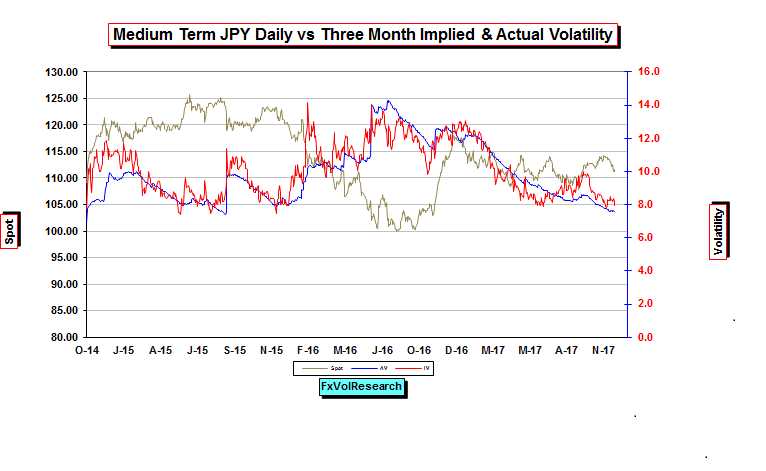 USDJPY three-month implied vols are still at a premium to the actuals but the gap is narrowing. The three month implied should re-test the 8% level where previously it has found good support over the past year. 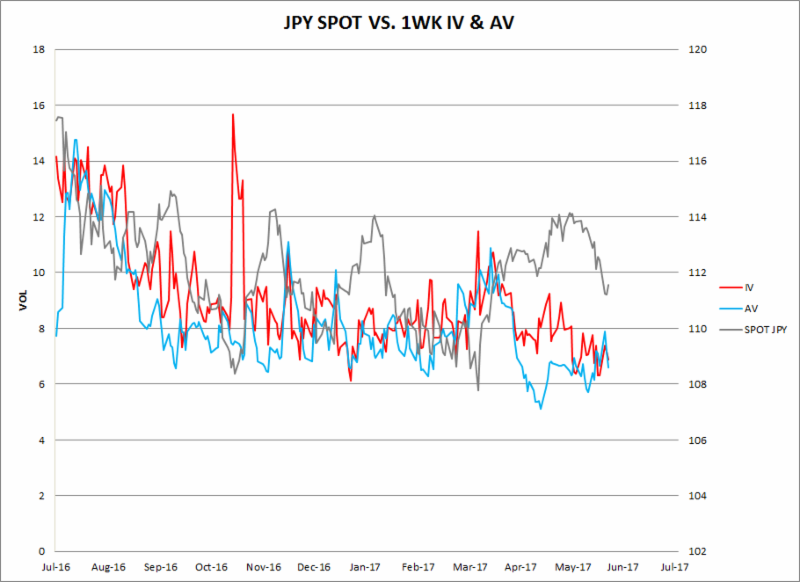 We pointed out last week that while short-term Yen actuals remain low the short-dated option prices remain at a substantial premium to the actuals. This was particularly the case over the Japanese election. While the spread has narrowed it is not yet in the bargain basement territory. 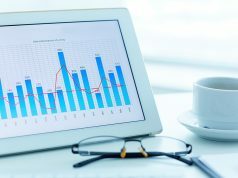 If one week gets back to 6%, and the recent actuals recording higher, then it will provide the kinds of setting that has enough statistical edge to constitute a buying opportunity. 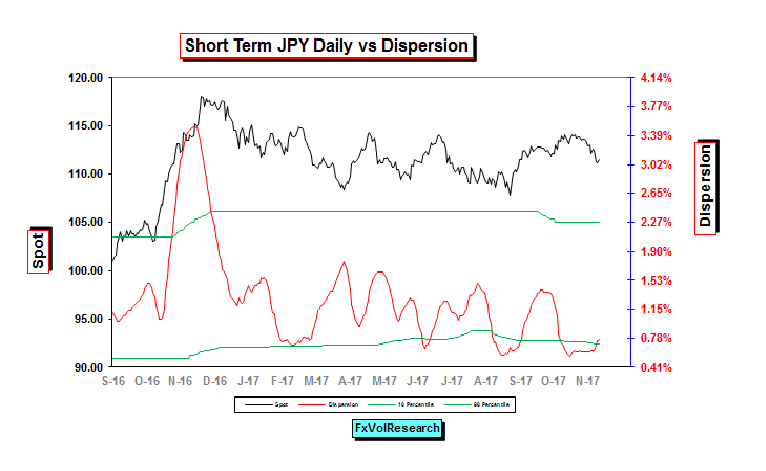 As we pointed out here last week, Yen dispersion remains low, but now there is evidence that it is turning higher. This increases the odds of forthcoming trending price action in the near term and supports, partially) our view that the Yen is due for a more generalized re-rating vs. the dollar and the crosses. 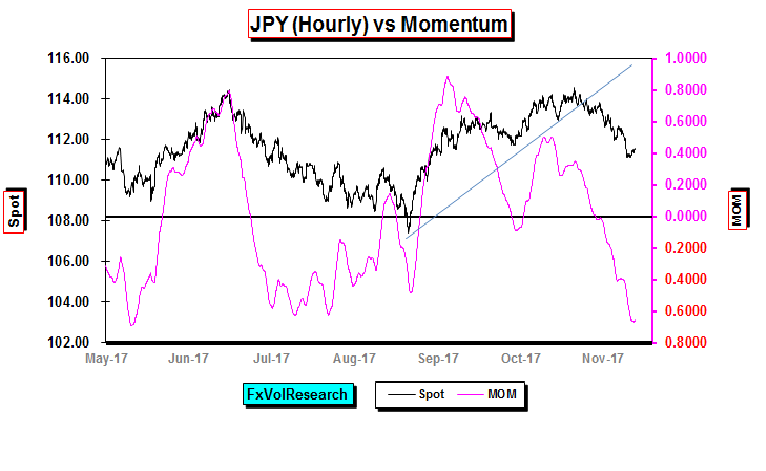 Yen momentum remains weak and is now likely oversold. A modest correction higher in the dollar is likely in order to remove this pressure and for the short-term US$ downtrend to resume. Yen actuals remain low and are now at lows for the past year. 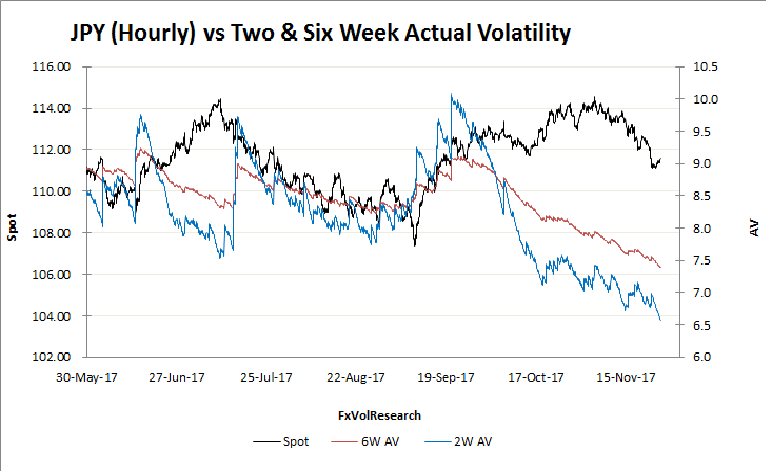 A modest dollar correction higher next week may be enough to compress the remaining premiums in the short-dated implied vols setting up a good buying opportunity in the short dates. This could be expressed in the form of short-dated strangles or directionally with Yen call spreads. 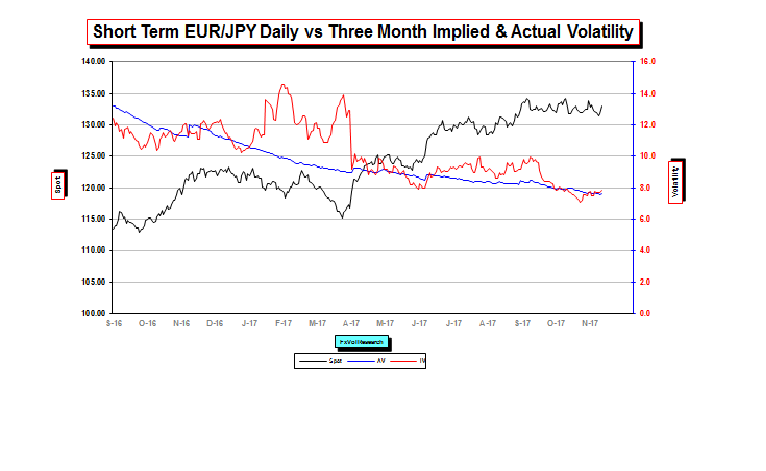 Despite the sideways consolidation in EURJPY, three month EURJPY implieds firmed up marginaly last week and now suggest they have found a near term bottom. 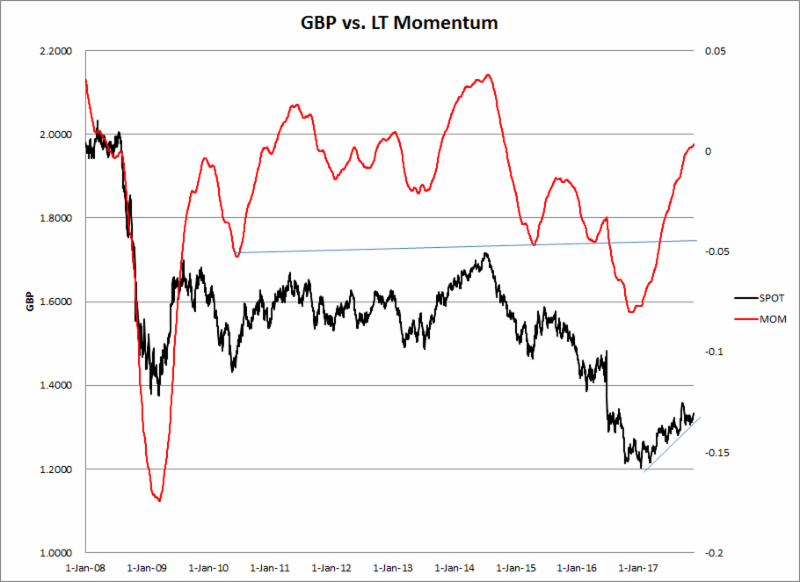 Looking at longer-term GBP momentum indicators puts the recent GBP rally into context. 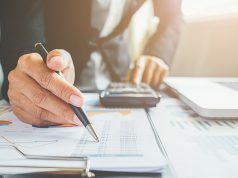 Despite a rally from lows under 1.2000 to test levels shy of 1.3600, GBP long-term momentum is now only back to neutral and may well be showing some early signs of leveling off. 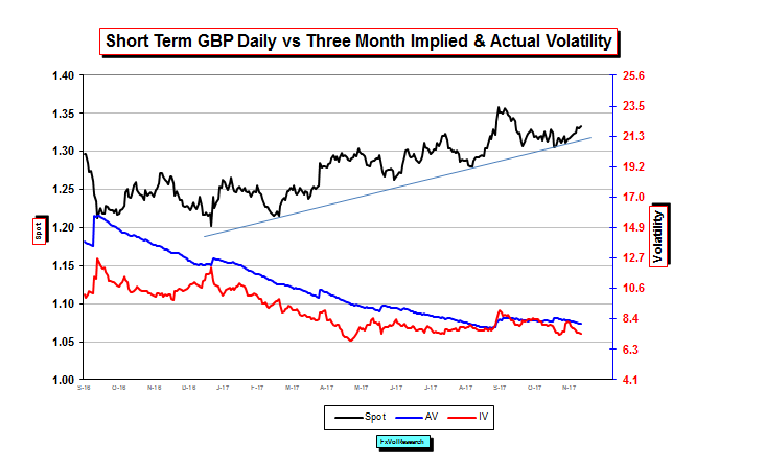 GBP continues to hold its short term dailly trend line while three month GBP implieds are back to trading under the actuals. Given the near term risks to GBP assets the market continues to remain complacent with respect to the outcomes of the near terms Brexit negotiations. 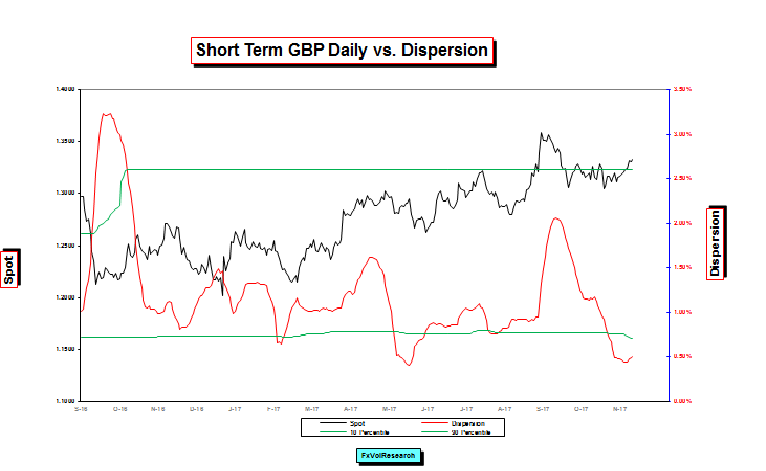 GBP dispersion is also low but now may have found a near term bottom. 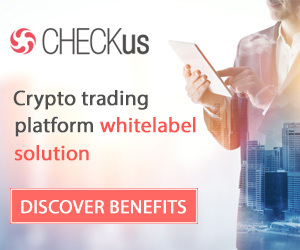 This increases the odds of more directional price acion in the near term. 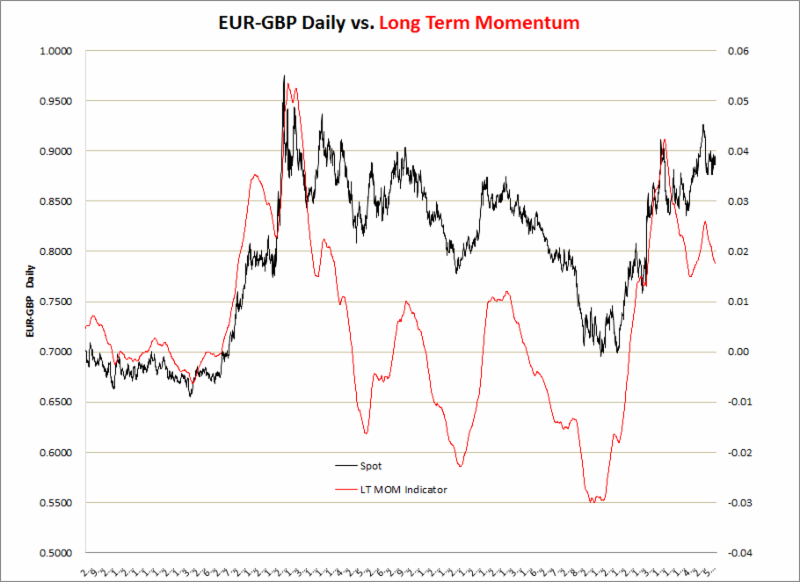 EUR makes a new high vs GBP, but momentum fails to make a new high. This divergence may be a sign of exhaustion in the EURGBP bull trend. We mentioned last week that short dated EUR option prices were too low, particualry in the two week period. 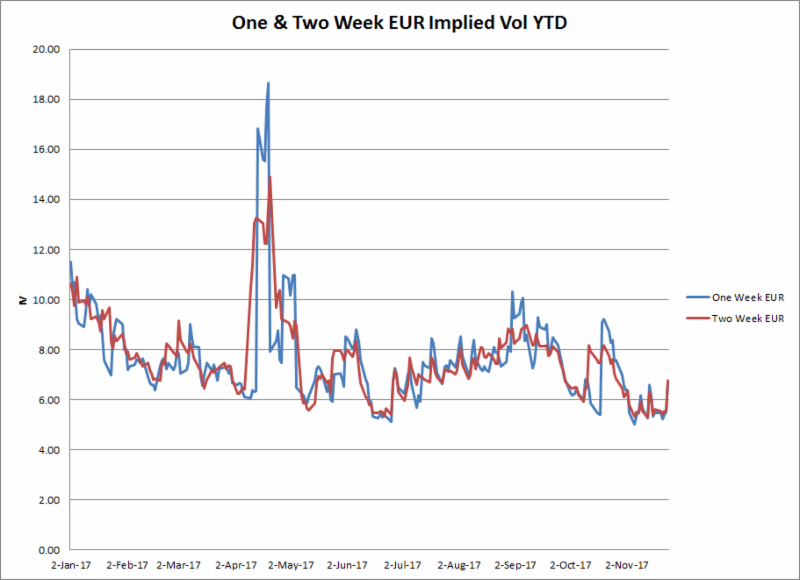 With the rebound in the EUR over the past week, the short dated EUR implieds are now off their lows and bck to the mid 6% level. 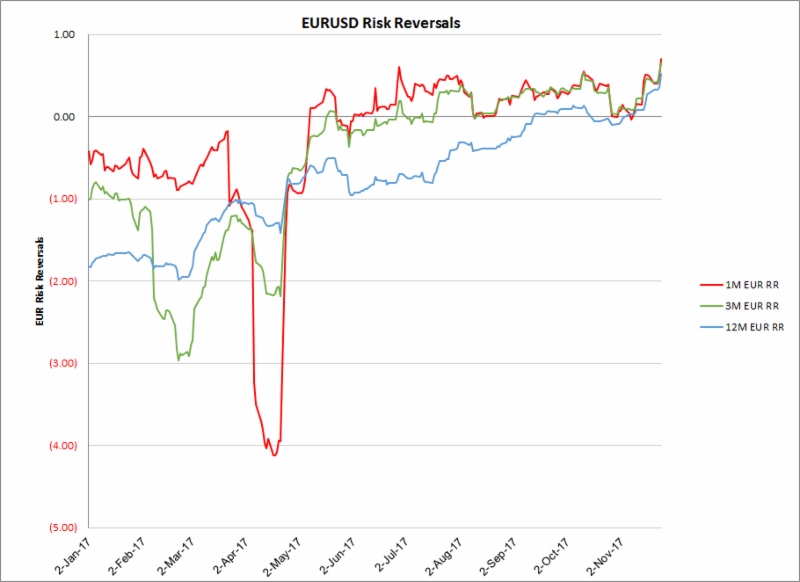 Like EURCAD risk reversal, EURUSD risk reversal moved higher on the week and the one year is at a new high. The main difference is the higher premiums for EUR calls vs the dollar in the one and three month periods while in the EURCAD curve most of the premium for EUR calls are concentrated in the back end of the curve, primarily in the one year.